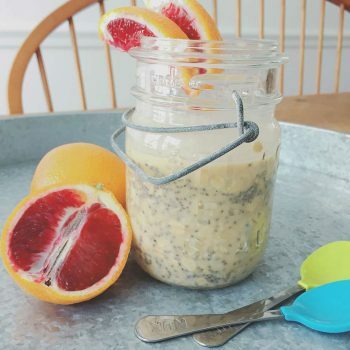 Toddler lunches can be tricky! Not only are toddlers notorious at this age for being picky eaters, but they are also great at changing their minds about what they want to eat 3 seconds before you put their plate down in front of them. Not to mention, they sometimes will devour their entire plate in 3-seconds flat only to ask for another snack an hour later, or better yet, take one itsy-bitsy bite of their food and declare they are full. So, when it comes to toddler lunches, I aim for healthy food that I can make in no time at all. 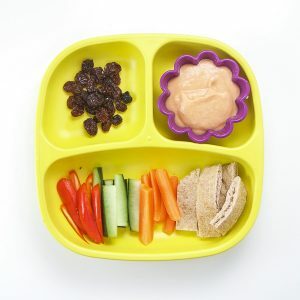 And, because I am not above adding in some extra bonus veggies into their food when I can get away with it, I partnered with my favorite store-bought baby food, Beech-Nut, to help pack these lunches with even more fruits and veggies. 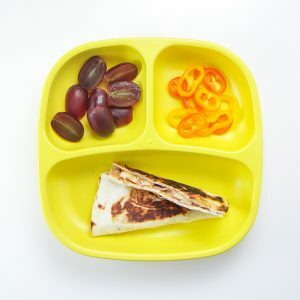 These combos are tried and true lunches that I serve Ellie and Parker on a weekly basis. 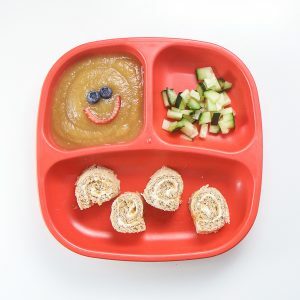 Carrot purée + cream cheese sushi sandwich rolls, Beech-Nut just apples purée (or applesauce of choice) with a smiley face and chopped cucumber. Place a piece of bread (I used whole wheat) onto a cutting board. Flatten the bread with your hand or a rolling pin as flat as you can get it without tearing holes into the bread. Cut off the crusts and trim bread into a rectangle. Spread roughly 1 teaspoon of whipped cream cheese onto the bread and then layer 1 teaspoon of a Beech-Nut organic banana, carrot & cranberry pouch (or your favorite jam) on top. Place the bread on the cutting board and starting with the short end, tightly roll the bread up into a sushi roll. Cut into equal pieces and serve. 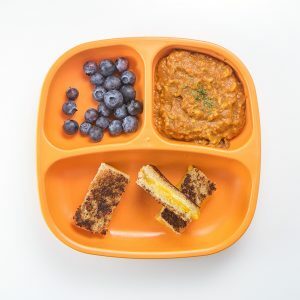 Hidden Veggies Grilled Cheese, macaroni rings with meat sauce (or soup of choice) and blueberries (cut in half for younger toddlers). Take 2 pieces of whole wheat bread and spread butter on the outside of each piece. Spread roughly 1 teaspoon of Beech-Nut’s just spinach, zucchini & peas on the inside of each piece of bread. Layer 1-2 pieces of sliced cheddar cheese on the side of the bread with the purée on it and lay the other piece of bread with the purée side towards the cheese. Grill the sandwich in a medium skillet on medium heat for 3 minutes, flip and heat for 3 more minutes or until cheese is melted and crust is brown. Let cool slightly, cut into slices and serve. The green purée almost completely disappears into the bread, so kids will never know it was there. Sliced pita, carrots, cucumbers and red peppers with carrot hummus and raisins. In a small bowl, mix together 1/4 cup plain hummus and 2 tablespoons just carrot purée until well incorporated. Here is my favorite homemade carrot hummus recipe. Surprise peanut butter banana quesadilla, chopped purple grapes and sliced sweet peppers. To make Surprise Peanut Butter Banana Quesadilla: Spread 2 teaspoons of natural peanut butter (almond butter or seed butter also works) onto half of a medium flour tortilla. Slice half of banana and place the slices evenly on top of the peanut butter. Drizzle 1 tablespoon of Beech-Nut’s just apple & blackberry purée (or favorite jam) over the bananas and peanut butter. Fold the tortilla in half and cook in a medium skillet over medium heat for 3 minutes, flip and cook for 3 more minutes or until brown on both sides.